Two programs enter. One leaves. Picture this, tiny assembly language programs battling each other in core memory space* each trying to overwrite the other. Survival of the fittest. It's called Corewar. It's a game. A really cool, but kind of old programming game. I haven't looked at it in years but something made me think of it. 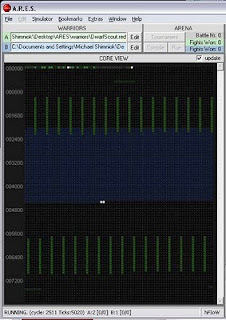 The game's assembly language, called Redcode, has 17 instructions and programs run on a virtual computer, the Memory Array Redcode Simulator (MARS) consisting of 8000 memory locations*. You can download various MARS implementations like A.R.E.S. or pMARS. The goal is to try to get another program to execute a DAT opcode, which will crash it. To do this, your code (warrior) has to drop a DAT into memory right where the other warrior's Program Counter (PC) is pointing to run the next instruction. Here's sample code from Corewars for Dummies. The instruction MOV 2, @-1 attempts to move the data in the memory cell PC+2 (the line DAT #33, #33) to the location specified in the second argument of the previous instruction... #9, that is. 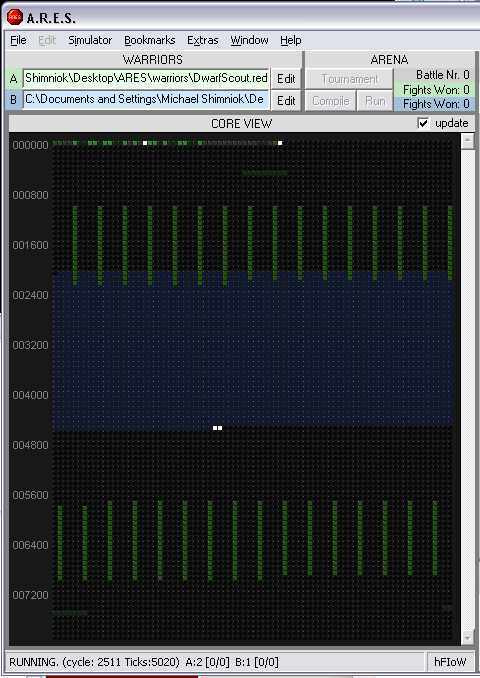 So it attempts to copy DAT #33, #33 to a location in memory 9 cells beyond the current program counter. Or, PC+9. You can imagine JMP -2, 0 jumps back to the ADD line. That is, it sets PC = PC-2. And the process starts over. Basically the code drops DAT bombs every 10 memory cells. Here's what battling warriors look like. Dig the cool 8-bit game music. * von Neumann architecture, of course.